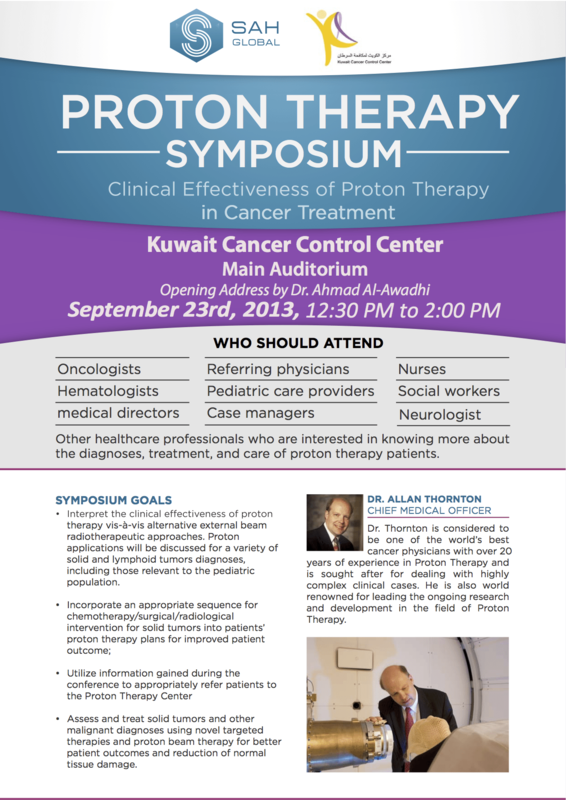 Experts from around the world gathered at a Proton Therapy Symposium held at the Kuwait Cancer Control Center, sponsored by SAH Global, to discuss the clinical effectiveness of proton therapy in cancer treatments. World renowned physicians and innovators in cancer treatments gathered to examine clinical advances and share knowledge in order to improve patient outcomes. The symposium’s opening address was delivered by Dr. Ahmad Al-Awadhi, Director of the Kuwait Cancer Control Center (KCCC). Kuwait Cancer Control Center is comprised of five patient care centers that specialize in medical oncology, stem cell transplants and diagnostic imaging. Founded in the early 1970s, KCCC is the only oncology hospital that covers care for all cancer patients in Kuwait. Featured speaker of the symposium was one of the world’s leading oncologists, Allan Thornton, MD, who serves as the Chief Medical Officer for SAH Global. He is considered to be one the world’s best cancer physicians and a global leader in the research and development of proton therapy. Dr. Thornton is sought by leading hospitals worldwide for his expertise in highly complex clinical cancer cases. 1- The assessment and treatment of solid tumors and other malignant diagnoses using novel targeted therapies and proton beam therapy for better patient outcomes and reduction of normal tissue damage. 2- Participants in the symposium included oncologist/hematologists, medical directors, nuclear medicine specialists, nurses, paediatric care providers, case managers and social workers. Together they participated in discussions that featured the clinical effectiveness of proton therapy versus alternative external beam radiotherapeutic approaches, proton applications for a variety of solid and lymphoid tumors and various diagnoses, including those relevant to the pediatric population. SAH presents these symposiums with the goal of sharing advanced cancer treatment knowledge within the worldwide clinical community. It is hoped that increased use of these methodologies will reduce the incidence of cancer and improve patient outcomes across the globe.